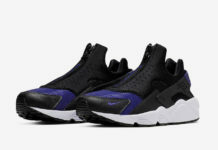 The Nike Air Flight Huarache is set to receive a brand new makeover for its new low top edition of the classic basketball silhouette. This upcoming Nike Air Flight Huarache Low is dressed in a White, Black and Pure Platinum color scheme. The shoe features an all-white leather upper with ostrich-style detailing hitting the heel to toe areas giving this silhouette a much more stylish look. Check out the official images below and look for the Nike Air Flight Huarache Low White Ostrich release later this Spring 2016 at select Nike Sportswear retail stores. For those looking for them now, you can hit up eBay. Previous articleadidas Yeezy 350 Boost “Turtle Dove” Releasing Again in May?